What’s orange, iconic, and lives in the permanent collection of New York City’s Museum of Modern Art? Hint: It’s not what you’d expect to see in a museum, and you might even have it in your home. It’s a pair of Fiskars scissors. 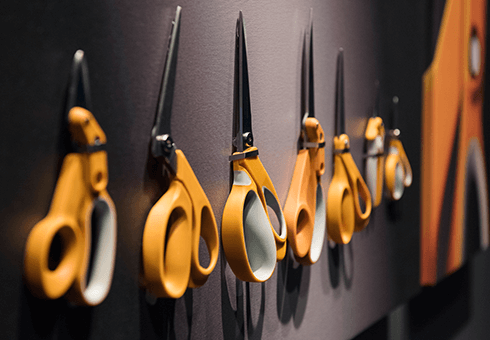 Instantly recognizable from their signature orange handles, more than one billion pairs of the scissors have been sold since their creation by Fiskars in 1967. A global company with a rich heritage (the brand itself started in Finland more than three centuries ago), Fiskars has had a presence in Dane County for 25 years. Offering much more than just scissors, the company has continued to evolve, expanding its market into areas like gardening, crafting, and cooking. Thanks to a unique partnership this spring between Fiskars and the Wisconsin School of Business, Wisconsin Full-Time MBA students from Professor Page Moreau’s new product development course had the opportunity to take what they were learning in class and apply it firsthand. Moreau, professor of marketing and faculty director of WSB’s Center for Brand and Product Management, brainstormed the partnership concept together with Jatin Khanpara, Fiskars’s vice president of product management and innovation, and Trupti Guha, Fiskars’s consumer insights manager. The project is designed to give students the opportunity to make an impact: Fiskars presents the class teams with an actual problem statement that the company is seeking to solve. Immersing themselves in the brand throughout the semester and applying classroom learning, students come up with an innovative solution to the posed question. It’s not the first time Moreau’s students have used WSB expertise to tackle a real world business problem. Moreau worked with students last year on an applied learning project with the Madison Public Market, and the year before that with Oral B. To launch the project, Fiskars invited Moreau’s class to the company’s state-of-the-art North American headquarters in Middleton. 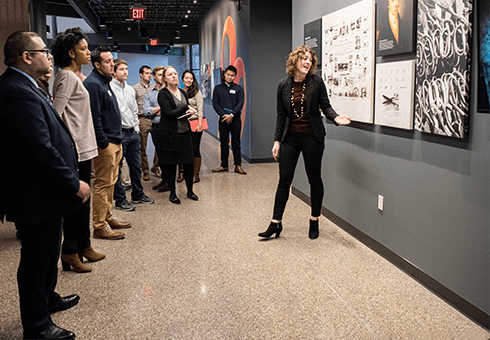 Blair Brophy, Fiskars’s public relations and social manager, gave students a tour and an introduction to the history and heritage of the brand. “It’s about the passion and self-expression from these products,” Brophy told the class. One of the challenges for students would be taking an established and beloved brand and introducing it to new generations without risking the quality or reputation of its past. 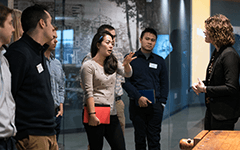 Marketing research student Duc Chau (MBA ’19) said the visit helped him learn more about how major companies conduct consumer behavior analysis. “I’m particularly impressed with the simulation room where Fiskars simulates the display space of its products in different retailers so that the company can conduct in-house studies on factors influencing the shopper decision-making process,” Chau said. 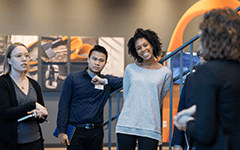 During the second half of the visit, members of Fiskars’s creative teams were on hand to present the problem statement and meet the students, all of whom were asked to sign a nondisclosure agreement to protect the confidential nature of the problem statement. Guha followed up with consumer insights, trends in the industry, and statistics on areas such as brand awareness and consumer spending on specific products. After opening the room up for questions, it was clear students were the ones in the driver’s seat now. A hand went up to ask whether Fiskars had considered a particular avenue of action. After the Fiskars team presented the problem statement, they advised students to use the insights they were given, outline what the company’s priorities should be, develop a strategic plan, and ultimately present it to the Fiskars team. They were also given parameters to work within, including the the target consumer, issues around sustainability and revenue, and alignment with the Fiskars brand. Dorn said that the Fiskars team was aiming to keep the scope as open as possible in order to maximize the students’ creativity and innovative thinking, so they could take what was most relevant and spark ideas for their team projects. During the course of the spring semester, students had a monthly check-in with Fiskars and were able to pull in knowledge and expertise from what they were learning in Moreau’s class, such as applications from case studies, design thinking, and frameworks like developing the ROI—return on investment. Among the challenges the students faced was taking the information they had been given as a jumping off point and having the ability to think beyond it to a bigger picture. The more questions her team asked, Abney said, the more constraints they found, forcing them to “thoughtfully consider” their choices and options at each juncture. “That’s actually really beneficial,” Abney said, “because we’re not always going to be able to ask for the sky and obtain that.” In the end, Abney said she and her team were proud of the research they put into their project and the final result they presented to Fiskars. Moreau said that some of the arduous aspects of the project along the way for students—such as narrowing down the wide scope of the job and the way the company encouraged students to think about innovation—offered real benefits to students as an end result.